Graham holds a MFA degree and a MS degree in Art and Art Education. He has attended many Photographic Workshops including The Ansel Adams Workshop at Yosmite. 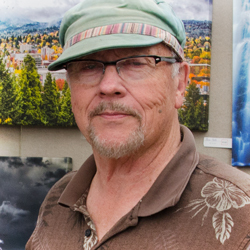 He has spent over 30 years teaching art in public schools while simultaneosly selling photographs in galleries and art festivals thoughout the Northwest. Photography gives me the experience of feeling close to the source. It is in discovering and creating images that make possible a deeper connection with the power, poetry, and divinity found in nature. Although there may be ways to synchronize with the rhythm of the universe, I have chosen to do it looking through a camera. It is my hope that others can share and participate, through imagery, the rapture of resonating with the deeper part of life and what it truly means to be alive. In the wilderness is the preservation of the world.